Prof. Zafar Khan taught ESL and Linguistics in Indian and Nigerian universities. He is the Ex-Principal of Austin Peace Academy, TX USA. 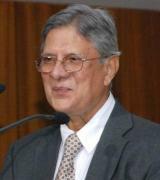 In 1982, he participated in a BBC Seminar on ‘Contemporary Grammar of English`, chaired by Prof. Randolph Quirk, Vice-chancellor of London University, gave a talk on All India Radio, Bombay on `Educational Trends in the Modern World.` He was interviewed by several TV channels as an ELT expert. Mr. Khan is author of books titled, ‘Thirty-Steps to Fluent Spoken English’, and ‘A New Companion to the Study of English Language and Literature.’ He can be contacted at zafar_khan1us@yahoo.com.